Carson City, Nevada. The Nevada State Railroad Museum in Carson City will run the historic steam train Saturday, October 31 in honor of Nevada Day. Fares are $5.00 for adults, $4.00 for seniors 65 and up, $3.00 for kids 6 to 11, and children 5 and under ride free. Trains run every 40 minutes from 10:00 a.m. – 4:00 p.m. The train departs from the Wabuska Depot on the Nevada State Railroad Museum grounds. Tickets may be purchased at the depot using cash or check only. The Nevada State Railroad Museum operates steam-ups with historic Virginia & Truckee Railroad equipment on select weekends throughout the year. The museum also participates in scholarly efforts, such as the annual Nevada Railroad History Symposium held in Carson City each fall. The museum is located on Route 395 at the south end of Carson City at the intersection of Fairview Avenue. A yellow train station and red water tank at the entrance to the museum grounds are landmarks. 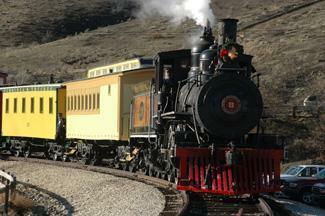 The Nevada State Railroad Museum is one of seven museums of the Nevada Department of Cultural Affairs. The Department serves Nevada’s citizens and visitors through cultural and information management, presentation and promotion of cultural resources, and education. The Department also includes the State Historic Preservation Office, Nevada State Library and Archives and the Nevada Arts Council. For more information, please call Teresa Moiola at (775) 687-8323 or visit the department’s website at www.NevadaCulture.org. Was this photo from May? I didn’t take the photo, it was submitted. But according to the EXIF is was taken in December 2004, probably during that year’s Santa Train. So the wreath on the headlamp makes sense! The museum’s #8 hasn’t run at all this year. #25 has handled all the steam-ups for 2009.